Three under five at the supermarket. :Women Make Waves Three under five at the supermarket. With three children under the age of five, the simplest of tasks are problematic. That’s why I decided to try and explain what a supermarket expedition with my kids is like and I choose the word expedition purposely. Before Children: What’s a shopping list? Food shopping is an outing. Walking around looking at food that looks yummy. Who cares how long it takes to prepare each meal – you have all the time in the world. If you happen to be the sort of person that ‘needs’ a shopping list – go ahead. You have time to create a spreadsheet and even print it out in aisle order. After Children: Shopping list? Hahahah! Finding a un-scribbled on piece of paper and a pen in the same vicinity of the house, at the same time, is an achievement in itself. Pat yourself on the back! Now taking the time to write a list without a little person needing that pen RIGHT NOW or tearing the paper from your hands and scrunching it up. Well, good luck with that one. “Yes I’ll grab my coat”. After Children: Collect handbag, checking you have keys, shopping list if needed, that everyone has their jacket, you have the changing bag, wipes, hand sanitiser, snacks and a drink then you are almost ready to go. Right kids, we are getting in the car please sit in your seats while I fasten your seatbelts. SIT!!! No fighting. Don’t bash that on the window. Where did you find that 2p? No I don’t know where you put your juice and no you can’t take the dinosaur in the trolley. Before Children: Park in a bay, pick up your handbag; purse, keys and phone. Enter supermarket. After Children: Find one of the HUGE child/family parking bays, which for some reason are right next to the store, which infuriates all the non-parents, causing periodic arguments from green eyed shoppers. Try and squish your car into the space while children recite/shout/screech (delete as appropriate) Twinkle Twinkle for the tenth time in two minutes. Tell children not to take off their seatbelts yet until the car has stopped. Then pick up your handbag and changing bag, open the boot if you need to remove your pushchair (be sure to forget the bags for life). Set up pushchair one-handed as you had to remove one child from the car due to fighting. Place wriggling/wailing banshee into pushchair and clip harness before child morphs into Houdini and gets away. Put brakes on pushchair. Now open rear doors to free the other two children. Ask them nicely to hold onto pushchair but take a look at your surroundings to work out where you can head them off when they blatantly ignore you. Okay who wants to go in the trolley? “me!” “I do”, “me too”. Fantastic! Explain to the children that we are food shopping, no we can’t go on all the rides outside – who decided that rides would be a good idea outside supermarkets. Whatever you do it’s wrong. If you let them go in them before shopping you will have tears that it’s over up and down every aisle. If you save it until afterwards you have a potential for tears all the way around and a tantrum in the car because it’s over! After Children: Take it in turns, right who wants to go in the trolley? “I don’t”, “not me”, “No- I don’t, he can” Joy. Choose a trolley with two seats and hope that in two minutes time two of your mini mes will want to go in the trolley. Before Children: Walk at your own pace, up and down the aisle, browse the magazines, DVD’s that aren’t animations… scowl at people with pushchairs containing screaming children. 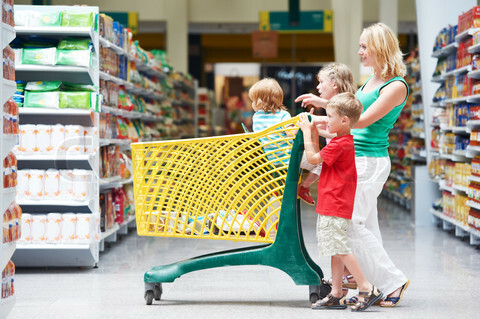 After Children: I don’t know if it’s just me but the feeling of dread I get when I walk through those supermarket doors is almost too much to bear. If you have a shopping list, its probably being stolen by your youngest or given to your youngest to help pacify them. Forget the list. By the time you get it back in your hands it will either be a 3000 piece jigsaw or resemble papier mâché. Try to keep little hands off the food, especially anything in glass jars or bottles and anything that can be turned to dust by those little hands such as crisps, biscuits, cereal, eggs – definitely do not let them near the eggs! Do this whilst trying to push the trolley and bribe two of your brood to sit in the trolley whilst attempting to push the pushchair and trolley too. Give up with pushchair and collapse and put in the trolley. Phew, you have your two hands back! That does now mean that at least one child is on the loose though. Encourage children to each hold onto an item and look after it in an attempt to make this pilgrimage a pleasant and somewhat educational experience. Make an effort to smile knowingly at those with three or more children, look especially sympathetic of those with a tantruming child, and try not to look too wistfully at those with no children, going around doing their shopping, maybe even holding hands – yes with each other, I know, I know – it shouldn’t be allowed. Before Children: Place items in order on the checkout, all the cans and jars together, then fridge, then freezer… pack at the other end. Pay – Done. After Children: Throw items on the belt as quickly as possible before the children get them or start fighting. Try to do this as quickly as you can before the assistant starts scanning. Now run to the other end to start packing whilst keeping one eye on the bickering kids, feeding them and supplying drinks where necessary. Throw items into shopping bags as quickly as possible and try and keep them as far away from little hands in the trolley for as long as possible. Now try and remove your purse from your handbag whilst prising little fingers off of it. Before Children: Push trolley, get to car, open boot, place in boot. Close boot. Take trolley back. Go home. After Children: Push trolley to carpark whilst trying to dodge the rides in the hope the children forget they are there. Trollies and children are a bad mix so try and point the trolley in the right direction whilst pushing with one hand and your hip. Hold third child’s hand very tightly. Arrive at the car, decide between three children loose in the car causing chaos or two contained and one on the loose while you place the bags in the boot. Place bags in the boot. Remove bags as pushchair is still in the trolley. Put pushchair in car, put bags back in. Close the boot. Pushing the trolley around to the side of the car, put brakes on and take kids out of the car one by one and install back in the car. Abandon trolley in first ‘safe’ area you can find. I know it’s naughty but the choices are taking three children to the other side of the carpark or leaving them alone in the car. It’s the lesser evil in my opinion. I remember reading an article where it said that it was easier to take two goats shopping than it was toddlers. I am inclined to agree. Did I mention that I now do almost all my food shopping online and have it delivered.